Tiger is an unlucky brand-name for Russian investment. The record of Mikhail Prokhorov and Maxim Finsky in trying, and failing three times over to sell shares in White Tiger Gold on the Toronto Stock Exchange explains. So why is the Russian Direct Investment Fund, a state development bank, betting on a small Australian-listed coking coal company in Chukotka called Tigers Realm Coal? The feareasternmost province of Russia, Chukotka makes a good case for ample underground resources to be mined, so long as costs of digging and shipping to China stay low; and demand recovers. 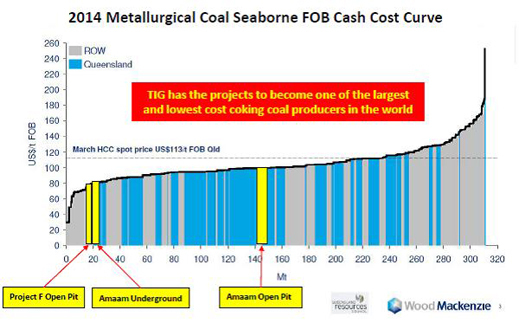 Perish the thought that Tigers Realm Coal is an insider manipulation with the aim of pumping the share price, then dumping the project by several names associated with such scheming in the past. One of the world’s leading mining analysts says of Tigers Realm Coal: “I like them, so go easy.” He means the positives outweigh the drawbacks. He’s a creditable advisor. There can be less confidence in the two small Australian brokerages which have issued recent reports on Tigers Realm Coal, Jim O’Sullivan of Morgans Dockland in Melbourne; and Hartleys of Perth, Western Australia. The former acknowledges he’s a promoter; the latter says it has been subsidized to do the research by the Australian Stock Exchange. 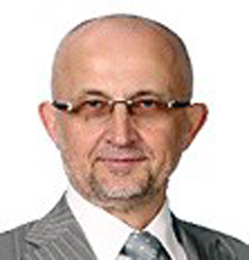 The Russian names associated with Tigers Realm start with Leonid Skoptsov, who is the chief executive of NPCC, the wholly owned Russian subsidiary of Tigers Realm Coal, and one of its licence-holders. Skoptsov was first reported as a Russian corporate raider by the New York Times in 1994. His record at Ovoca Gold, a London-listed miner in Magadan, was criticized in 2007 for too much stock market manipulation, too little mining. That story can be read here. In his resume for Tigers Realm Coal Skoptsov also claims executive associations with Pervaya Gornorudnaya Kompaniya, which he calls “a zinc-lead asset developer”; and OAO Volganeft, a midsize oil driller. The public record of the first doesn’t establish the outcome is a working mine. The record of the latter at the US Securities and Exchange Commission (SEC) reveals controversy over asset value, revenues and liabilities. Skoptsov may have sold out and jumped clear beforehand. 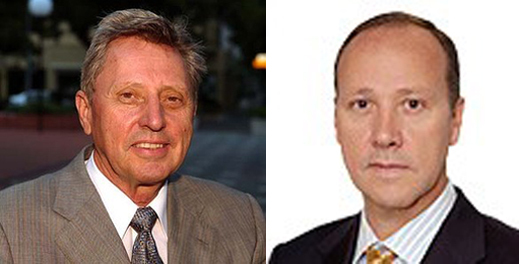 The second Russian name is Tagir Sitdekov (below left) who is a director of the Russian Direct Investment Fund (RDIF). Before that employment, he says he ran A1, the asset holding of Mikhail Fridman, (right) between 2005 and 2011. During that time, A1 attempted to make a go of several mining investments in Russia, Cuba, Indonesia and west Africa. They proved to be short-term arbitrages in Friedman’s mind, and unprofitable ones at that. He dropped them all. RDIF has repeatedly refused to put through a telephone-call or email to Sitdekov. The spokesman for RDIF, Maria Medvedeva, gives out a telephone number she doesn’t answer. She has been asked to clarify why RDIF is investing in Tigers Realm Coal. She refuses to reply. When a fight among the shareholders broke out in the following weeks, RDIF said nothing. Dmitriev was misleading. The first “commitment” was an investment in the initial public offering of Alrosa, the state diamond miner. RDIF is coy about that one, mentioning that one of the other investors in the RDIF consortium for Alrosa was something called “Capital International and Charlemagne”. That turns out to be a vehicle of the Regent Pacific group, which is owned and run by Stephen Dattels and James Mellon. At London headquarters for Charlemagne, here is Mellon on the board. He has also joined RDIF at Tigers Real Coal. Regent Pacific is a Hong Kong-listed mining investor with a current market capitalization of less than $50 million. Its chairman Dattels, a Canadian, started his reputation with Russian officials for pump-and-dump schemes with Everfor Diamonds, which was first listed in London in 2004. After Dattels had left, and shareholder money was exhausted, Everfor reported it had not found anything worthwhile. Dattels is currently under investigation in France and Canada for the unusual billion-dollar pricing and writeoffs in Uramin, a Namibian uranium project sold to the French state company Areva. About Dattels in Russia, read on. About Dattels in France and Namibia, start here. A television documentary on the Uramin affair, Dattels, and his French associates will be broadcast on France 3 next week. for their Croatian banking operations. They haven’t proved to be an harmonious bunch. According to the current company chart above, Bruce Gray (below, left) holds 13%. 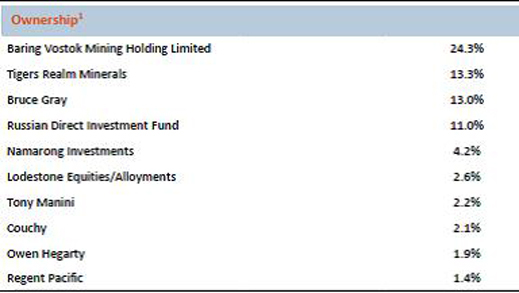 Just before RDIF and Baring Vostok made their concert-party move into Tigers Realm Coal, Gray had built up his shareholding to 19%. He also took a seat on the board in October of 2013. 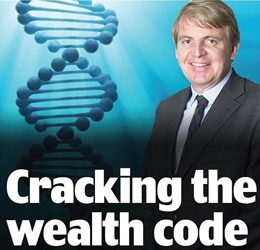 When the newcomers proposed to offer more capital to the venture than he had, diluting his shareholding, Gray fought back, taking his objections to the proposed scheme to the Australian government’s Takeovers Panel. When the panel told the company it was leaning towards Gray, and “minded to make a declaration of unacceptable circumstances,” a deal was struck between the incoming Russians, the company and Gray. The details can be read in the Takeovers Panel report. Gray left the board, to be replaced by Andrew Gray (above right). The Gray stake shrank to 13%. The share price dropped on the Gray dispute, but it hasn’t recovered significantly with the result, or the availability of the Russian money. Current market capitalization is A$88.5 million (US$74 million), down 40% since the December deal was announced. Arguably, the Chukotka region makes a better case for itself than Tigers Realm Coal. Mining development in the region has proceeded strongly since Roman Abramovich exited the governor’s office in 2008, and the regional parliament in 2013, taking his gotten gains with him to London. For that tale, click to read and this. Mayskoye, one of the two goldmine assets Abramovich traded for cash, is in production. The second asset, Klen, is nowhere near it. 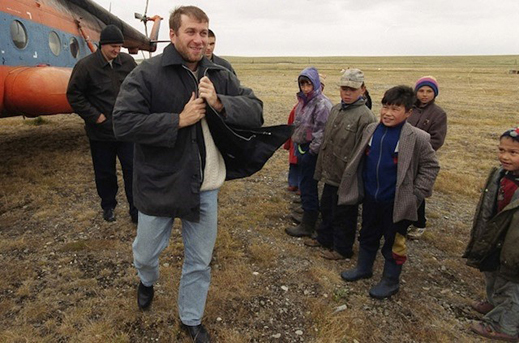 Abramovich (below) claims to have spent more than $2 billion out of his pocket in Chukotka region. The bigger mining picture for the region includes both foreign and Russian investors aiming to develop gold and silver, copper, and coal, with possibilities for oil, gas and tin. In 2012 mines in production in the region produced 564,000 troy oz of gold, 5.5 million oz of silver, 330,000 tonnes of coal. According to Kinross Gold of Canada and Russia’s Polymetal, the leading goldminers in the region, production and sales continue to grow, though costs of production have been increasing too. Cost of production is a big advantage on the boast sheet of Tigers Realm, as roughly half world’s mines produce at a lossmaking cost above the global average. 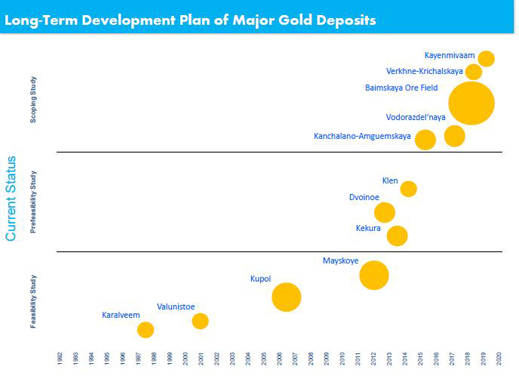 According to a veteran chief financial officer for London-listed mining companies, at the feasibility stage of a new mine the margin between cost of production and commodity price should be 100%, in order to allow enough leeway for development costs to rise unpredictably; other guesswork to go awry; and the commodity price to fall short. Applying this rule of thumb, if the coking coal price is $120 per tonne, Tigers Realm Coal’s Chukotka cost of production should be averaging $60/t. 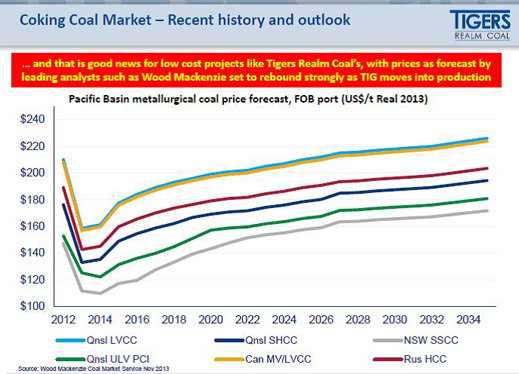 Put the calculation the other way round, if Tigers Realm Coal is right in projecting a $98/t average cost of production, as it did in its March 2013 pre-feasibility study, then to be profitable the coal price must reach $196/t. 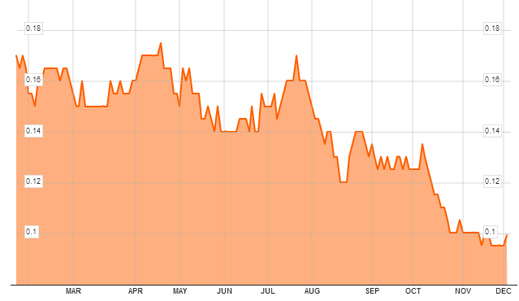 At last month’s recalculation of cost at $68.5, the coal price must be $137. On November 20, Craig Parry, the chief executive of Tigers Realm Coal, said: “We have in place our starter mine and development fleet and we expect to have Project F’s mining licence soon. With the interest we are receiving for project funding, we are well on target to become a coal producer by end of 2015.” He is implying that for the first two to three years the mine will be producing at a cost that will be above the selling price of its coal. The feasibility study also warns of these downside risks – if the coal price sticks at $128; if site operating costs grow by 10%; and if capital required jumps by 10%. For the time being, it isn’t quite clear how much capital the company must raise to commission its mine. The numbers vary in company papers from $93 million to $133 million to $200 million. 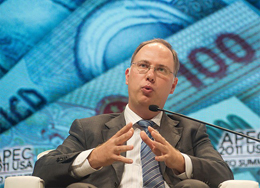 Cash in hand at the moment, thanks to the Russian investment, is about $50 million. According to last month’s feasibility report, total direct outlays are estimated to be $94.2 million, and with indirect costs, the total comes to $121.7 million. Qualifier: “the accuracy of the estimate is assessed to be within a range of 10 to 15%.” The new report says Tigers Realm Coal is aiming to borrow this money, not draw more from shareholders. Banks will ask the same questions about cost risk, price risk, and shareholder risk which RDIF refuses to answer. There may be one more catch – a silent partner. According to Tigers Realm Coal, it is holding mine licences through Rosmiro Investments, a Cyprus-registered entity in which Tigers Realm Coal has 80%. The 20% remainder is held by an entity called B.S. 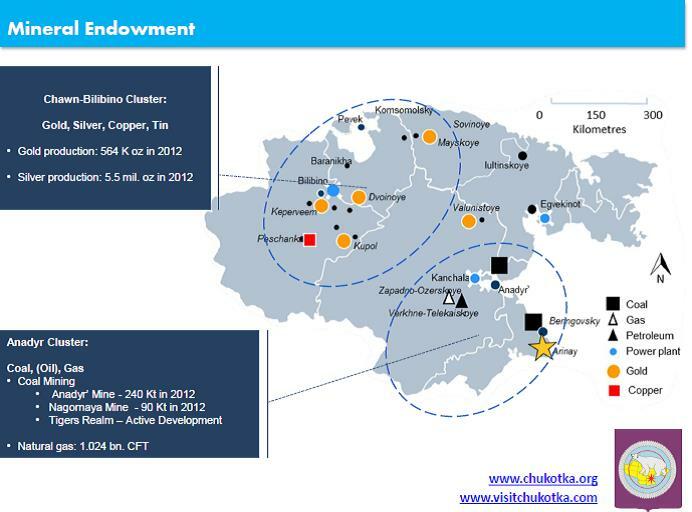 Chukchi Investments. Depending on what BS stands for, and who stands behind the name, the risk may be negligible. According to Tigers Realm Coal, once these two stakeholders agree the bankable feasibility stage of the project is complete, then they must negotiate between themselves on how to find the money required to start mining. They have already agreed that Tigers Realm Coal must raise 80% of that extra capital; BS Chukchi, 20%. These steps “will now commence”, Tigers Realm Coal has announced. So who is BS Chukchi? Tigers Realm Coal refuses to say.